Hindenburg cross, for non Combatants. Good used condition. Maker marked 'W.K', Wilhelm Kolwitz Bergedorf. Bra använt skick. TIllverkarmärkt 'W.K', Wilhelm Kolwitz Bergedorf. .
First of the many awards instituted by the Third Reich, the "Ehrenkreuz das Weltkrieg" was established on July 13, 1934, by President Generalfeldmarshall von Hindenburg (therefore it also known as the Hindenburg Cross). 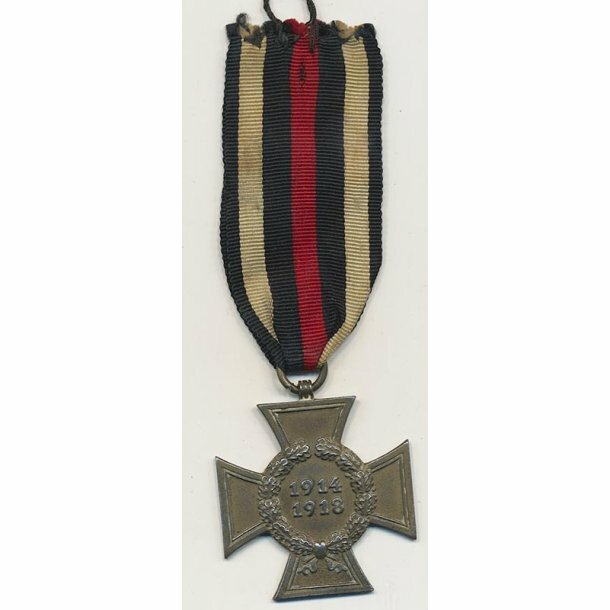 The Cross, which commemorated those who served (and fell) during the Great War, was introduced as a way to reinforce pride in the veterans, and current armed forces. The only military commemorative award to be introduced during the Third Reich era, it was created by Eugene Goted, who received the commission from the Reich Chancellery.